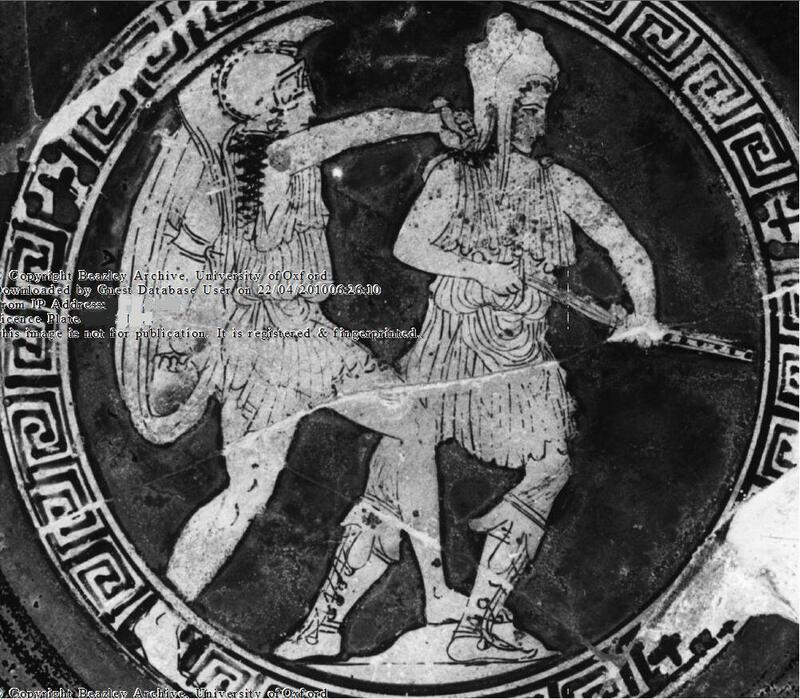 In an earlier post, I wrote that hoplites in the crowd of othismos could strike with short swords over their shields into the necks of their foes in a truly brutal manner. I happened to find an image that shows what this strike would have looked like and where it would have been delivered. 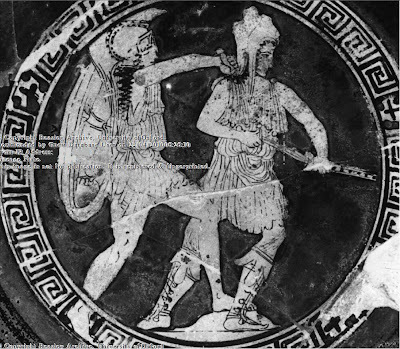 Obviously the artist is not depicting othismos, but the arm position of the hoplite and the insertion point, along side the neck into the chest cavity(but on the left), are similar. “The brigadier-generals drew them up—each one ten thousand men, a hundred square; for this, they said, was their manner of arranging their order of battle at home. “When phalanxes are too deep to reach the enemy with weapons,” answered Cyrus, “how do you think they can either hurt their enemy or help their friends? Xenophon surely knew what he was talking about when it came to hoplite battle and he clearly states the uselessness of such depth. Reading this section alone, I would have a hard time supporting a notion of othismos that brings the force of deep files to bear. Xen. Cyrop. 6.4.17 The infantry that you will fight against, you have fought before—all but the Egyptians; and they are armed and drawn up alike badly; for with those big shields which they have they cannot do anything or see anything; and drawn up a hundred deep, it is clear that they will hinder one another from fighting—all except a few. 18] But if they believe that by rushing (ὠθοῦντες) they will rush us off the field, they will first have to sustain the charge of horses and of steel driven upon them by the force of horses; and if any of them should hold his ground, how will he be able to fight at the same time against cavalry and phalanxes and towers? And that he will have to do, for those upon our towers will come to our aid and raining their missiles upon the enemy will drive them to distraction rather than to fighting. The translator has chosen the word “rush”, but you may recognize the root of Othismos in the actual word used (in bold), thus “push” and “pushed” (or perhaps crowded). Xenophon is clearly stating that the deep phalanx can push his shallow Persian phalanx from the field. The reason he is confident it will not happen is his use of combined arms against it. The first two ranks of the Persians simply have to slow the Egyptian advance while the rear ranks rain down missiles (Interestingly this is a similar mechanic to both the actual Persian tactics and the later Roman Fulcum). He even has set towers on the field to shoot down into the ranks while his cavalry is supposed to hit them in the flank and rear before they can in fact push the Persians from the field. Xenophon, Cyropaedia 7.1.33] Here, then, was a dreadful conflict with spears and lances and swords. The Egyptians, however, had the advantage both in numbers and in weapons; for the spears that they use even unto this day are long and powerful, and their shields cover their bodies much more effectually than corselets and targets, and as they rest against the shoulder they are a help in shoving. So, locking their shields Together, they advanced and showed. until they came up under cover of the moving towers. When they reached that point, the Egyptians in turn received a volley from the towers; and the forces in the extreme rear would not allow any retreat on the part of either archers or lancers, but with drawn swords they compelled them to shoot and hurl. 35] Then there was a dreadful carnage, an awful din of arms and missiles of every sort, and a great tumult of men, as they called to one another for aid, or exhorted one another, or invoked the gods. 36] At this juncture Cyrus came up in pursuit of1 the part that had been opposed to him; and when he saw that the Persians had been forced from their position, he was grieved; but as he realized that he could in no way check the enemy's progress more quickly than by marching around behind them, he ordered his men to follow him and rode around to the rear. There he fell upon the enemy as they faced the other way and smote them and slew many of them. The Egyptians are surrounded and ultimately surrender. To understand this passage, we need to look not only to the context within this book, but to Xenophon’s recent experience. He wrote this book after the Theban 50 rank phalanx at Leuctra and most likely after the 50 rank phalanx at Mantinea as well. These extra deep phalanxes had made resistance in othismos against them futile. In effect, these are the ultimate expression of othismos, but also very vulnerable. The Thebans had been experimenting with deep phalanxes since at least Delium, where Pagondas formed 25 ranks deep in order to force his way through the Athenian phalanx. They habitually formed in more than 16 ranks and apparently violated a treaty during the Corinthian war designed to force them into a maximum of 16 ranks so as to lengthen the allied battle-line and avoid being flanked by the Spartans. We don’t know the depth at Tegyra, but perhaps the Sacred band did not need extra depth against a foe who erroneously allowed them to break through their battle-line because they assumed the Thebans were attempting to escape the field. They may have had the second phase of Coronea in mind, where Xenophon chided Agiselaos for the bloody battle that ensued when he headed off a retreating Theban formation (probably 25 ranks deep). At that battle they broke through the Spartan center eventually as well, but were spent and routed. The culmination of all of these experiences with depth was the Theban 50 rank phalanx at Leuktra/ Leuctra. It was not a “column”, as is often stated, any more than a 16 rank taxis was a column, but something like an 80 by 50 rectangular taxis. Hoplites did attempt to engage from marching column on occasion and things did not go well. The 50 rank taxis at Leuctra and Mantinea proved unstoppable, but in no way simply steam-rollered the Spartans from the field. The mechanics of pushing en mass require this to be a slow process and problems of packing within the ranks of each phalanx and moving in unison ensure that there could be a give and take of ground of the type that we read about in accounts of the battles. But a ratcheting advance of the great Theban mass was always likely to win in the end. 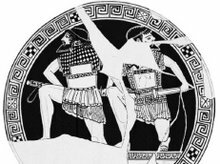 Xenophon knew all of this and as an astute general could see the weakness of the extra-deep phalanx to flanking maneuvers and the inability of missile troops to shoot over the deep mass effectively. Thus he does not attempt to do more than slow the Egyptian (Theban) phalanx, while shooting into the mass with missiles both from the rear ranks and down from mobile field fortifications. I’m tempted to think he would have presaged the Spartan tyrant Machanidas’ use of artillery against the phalanx had he not set his book in the Persian past. While he is slowing and distracting them, his cavalry envelops them from the rear and secures victory. The obvious weakness of the ultra-deep phalanx to flank attack rendered the whole tactic something of a trick that was impossible to carry out against a forewarned and properly armed foe. Already at Mantinea it is possible that the death of Epameinondas was no accident of battle, but indicative of the Spartans hitting the unsupported right flank of the Theban formation. Their inferiority in cavalry compared to the Boeotians rendered outflanking around the left flank unlikely. I generally follow Plutarch’s version of the death of Epameinondas where he is killed by a Spartan sword, but Ephorus, via Diodorus, has him felled by javelins. If there is any truth to the latter it perhaps reflects a Spartan mirror (precedent?) of the thinking of Xenophon’s fictional tactics.